Not only do citrus trees (Citrus spp.) yield ornamental and tasty fruits, the trees are handsome landscaping subjects. The genus is hardy in U.S. Department of Agriculture plant hardiness zones 9 through 11, and there are numerous citrus species and a huge number of cultivars. Citrus trees can harbor a number of pests and diseases, with a few having noticeable white coloration. The conspicuous color can help to observe and monitor them. It's usually easy to spot cottony cushion scales. These insects secrete a conspicuous, heavy coating of white waxy filaments over their bodies. Females produce fluted egg sacs about 1/2 inch long that are more prominent than the insects themselves. As they feed on sap, the insects produce large amounts of sticky honeydew that attracts ants and on which a black mold grows. Look for them on citrus stems, twigs, leaves, branches and trunks. University of California Integrated Pest Management specialists advise avoiding insecticide use and allowing natural biological control agents to work. The vedalia beetle and the parasitic Cryptochaetum fly work well to control cottony cushion scale in California, and they are already present in the environment. Because ants carry the scales to uninfected plants, controlling ants helps with scale control. Related to cottony cushion scale, mealybugs are smaller and the waxy coating less impressive. Adults are 1/8 to 1/4 inch long. The pinkish body of the citrus mealybug shows through the mealy white wax covering. Find them on leaves, twigs and fruit. These sap feeders also secrete honeydew. Natural predators such as lacewing larvae, syrphid fly larvae and lady beetles help control mealybugs, in addition to an introduced beetle called the mealybug destroyer. As with cottony cushion scale, control ants to help control mealybugs. If you shake a citrus branch and many tiny white insects fly from the leaves, the citrus is infested with whiteflies. Check the undersides of leaves to see the small pupae and smaller immature nymphal stages of the whiteflies. 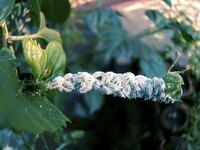 Woolly whitefly nymphs and pupae have abundant white wax curls. Although whiteflies feed on tree sap, the main damage to citrus is from the abundant honeydew the nymphs excrete and the mold that grows on it. Large whitefly infestations can coat trees with honeydew and mold and can turn the whole tree black. Natural predators of whiteflies usually control them, and ant control also helps. In Florida, several species of fungi attack whiteflies. Called friendly fungi, they can effectively control whitefly during rainy weather. The brightly colored orange, yellow or brown fungi attack whitefly pupae. Sometimes you'll see a whitish, round patch start to grow on the outside of a citrus fruit. As it grows, the center turns greenish, surrounded by a broad white band of new fungal growth. Called green mold, it starts in an injured area and spreads. The fungus also grows on fallen citrus fruit. Pick or gather and dispose of any citrus with mold on it. This fungus is present throughout the citrus-growing areas of the world. Control it by good sanitation and by preventing injury to citrus fruit.